If I close my eyes, breathe in deeply, and think back of our vacation, the first image that comes back is the market at La Esperanza, Honduras and the wonderful smell of the Honduras coffee brewing. It might come as a surprise to some but coffee’s roots are not Honduras nor Central American. The Spaniards brought the plant wi th them, but not until the 1700's. Coffee originated in the Ethiopia area of Africa where the goatherds long ago chewed the bean at night to stay alert. When you ride through the Honduran highlands, you are traveling through some of the finest coffee country in the world. Keep your eyes out for Honduran coffee; it is a bush that is often planted in the shade of larger trees. There are over 90 million Honduran coffee bushes in cultivation. 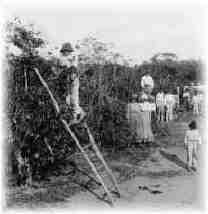 Pictured here is an early, clear-cut coffee plantation7 from the turn of the century. Honduran coffee, most of which is a rich arabica coffee, is used mainly by coffee retailers as a blending coffee but Honduran coffee certainly is good enough to stand on its own (see Sweet Maria's excellent review of a Honduras coffee from the Santa Barbara area). Honduran coffee growers have not been able to “brand” Honduran coffee like growers in other countries have. Walk into any grocery store and you can find a can of coffee with the tag line "100% Colombian coffee." Guatemalan and Costa Rican growers have pulled off the same type of branding in the coffee boutiques. Honduran Coffee? Not yet. But stay tuned. As (if?) the infrastructure improves in Honduras, I believe you will see Honduras moving from the back seat to the front seat. 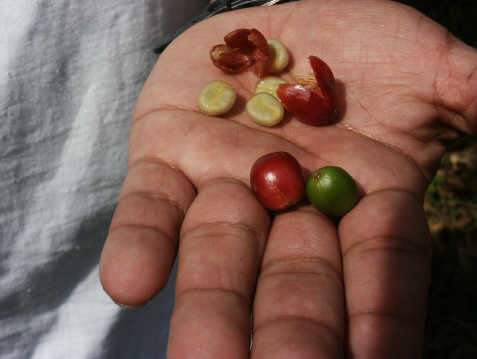 (Sweet Maria's excellent site on coffee has a good article on Honduras coffee). · The elevation. The higher the elevation, the better the coffee. The Honduran government, in an effort to “brand” Honduran coffee, has become more particular about labeling (and monitoring) “strictly high grown” (sometimes called “strictly hard bean”) coffee. The higher the altitude at which it is grown, the denser the bean. Strictly high grown coffee grows more slowly than coffee beans grown at lower altitudes, adding to the price. To meet the SHG (or SHB) criteria, the coffee must be grown at 4900 to 6400 feet. · The soil. The rich volcanic Honduran soils are ideal for quality coffee. 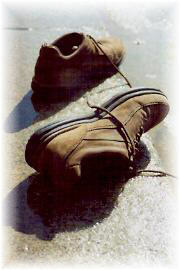 · The processing, handling and transport. The finest bean in the world (Panama's Hacienda la Esmeralda just set a record with an auction prices of $50 + for 6 bags of coffee) isn't worth a plug nickel if it is handled improperly during processing, it stored incorrectly, or sits in a New Orleans warehouse for months without proper humidity/temperature control. · The climate. Honduran coffee grown in shade is superior to the coffee grown in the sun (one taste of a Vietnamese coffee reveals this). Adequate rainfall (Honduras has little irrigation to speak of) is critical for a successful crop. · When a bean is picked. Expensive coffees are pricey for a reason. To reach its fullest maturity, flavor and taste, a bean is best picked at its “red- berry” stage. Since coffee beans don’t ripen uniformly, multiple pickings offer the best coffee bean (rather than a one-time, 'strip the bush' approach). · And last, but certainly not least, the very nature or quality of the coffee bush - - the cultivar itself. You reap what you sow. Coffee bushes will bear their first harvestable fruit 3-5 years after being planted. Bushes may last as long as 15-20 years. One bush will average 1 pound of beans a year (bumper crops are known as with any other crop if all conditions are ideal that year). Coffee does better in the shade although large fincas (plantations) now plant sun-tolerant variants, row upon row in the sun. Sun-planted coffee is a less sustainable farming practice and introduces the intensive use of chemicals (see below). Prices for Honduran coffee in Honduras vary, depending on quality. You can expect to pay $.48 - $3.00 per pound. I picked up a couple of pounds of coffee in the open-air market in La Esperanza for $.48/pound. It had a very “earthy” taste. The quality was about at the level of the inexpensive Asian or West African coffees that have flooded our markets in the last year, driving the Honduran coffee grower to his knees. When buying Honduran coffee, look for one that says, “Strictly High Grown, European Quality (or Style).” There are excellent coffees to be had. I enjoyed the coffee at Welchez in Copan and also bought some Bella Vista (Beautiful View). If you can’t find Bella Vista elsewhere, know that it is available at a shop in the San Pedro Sula airport. Historically, coffee was grown under the shade canopy of larger trees15. Sun-tolerant bushes have been developed and can be seen on plantations (fincas) that often stretch for miles. Forests are clear-cut for their timber and coffee is planted in the sun. This type of coffee production employs vast amounts of herbicides and pesticides and devastates the earth, spills pollutants into the water systems, and adversely affects the fauna. Efforts are underway to address this devastating farming practice. The Songbird Foundation has an excellent overview which discusses the impact of coffee growing practices on the farmer, the earth, and the animals of coffee producing countries. I encourage you to take a moment or two to become aware and informed of the importance of your decision on what type of coffee you buy. You can make a difference. Buy a coffee produced with sustainable practices by small farmers who receive a fair price for their work (know as Fare Trade coffee). More on Fair-Trade coffee can be found at Transfair USA, the only independent, third-party certifier of Fair Trade practices in the U.S. Excellent material is also available from the Smithsonian National Zoological Park website where they discuss the case for sustainable coffee production. Honduran coffee is available for purchase on line. Organic coffee from the Emaus Foundation is now available online as well. Proceeds from the sale help provide secondary school scholarships for academically motivated rural girls who live in the La Libertad area. Café Welchez is a shade tree coffee, grown at the Finca Santa Isabel, and shipped from Miami. Try some. ● Stone Creek Coffee - Wisconsin's finest, served up right here on the net. Try the organic Mexican or Peruvian Fair-Trade coffee in a strong latte. ● Dean Bean's offers only Fair-trade organic coffee (yes!) and is an old-fashioned "you are the customer" type of place. I love the feature where I can select and mix my own roast. Prices are the best on the net. ● Churchill Coffee – Fair-trade practice; portion of proceeds goes to Our Little Roses Episcopal home for girls, San Pedro Sula. ● And for our Canadian friends, here is a fair-trade online firm out of Nova Scotia: Justuscoffee.com. This recommendation comes from friend Bob Chasen who vacations up nort' near them.